Volkswagen plans to launch 30 all-electric models to reposition itself as a leader in "green" transport. Matthias Mueller, chief executive of Europe's biggest carmaker, said huge investments would be needed as the firm moves beyond the "dieselgate" scandal. He hopes that by 2025, all-electric cars would account for about 20-25% of the German carmaker's annual sales. Latest figures show that sales growth of Volkswagen-branded cars continues to fall behind European rivals. Outlining what he described as the "key building blocks in the new group strategy", Mr Mueller said VW aimed to "transform its core automotive business or, to put it another way, make a fundamental realignment in readiness for the new age of mobility". VW will focus on "the most attractive and fastest-growing market segments", he said. "Special emphasis will be place on e-mobility. The group is planning a broad-based initiative in this area: it intends to launch more than 30 purely battery-powered electric vehicles over the next ten years," he said. 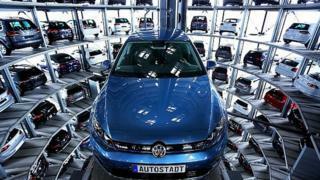 VW was plunged into crisis when it was revealed in the US last September that diesel engines had been fitted with software that could distort emissions tests. The company later revealed that some 11 million cars worldwide were affected. Mr Mueller said VW's transformation would involve investments in the double-digit billions of euros, funded by savings and cost-cuts, with all brands and businesses having to contribute. He told reporters at VW headquarters, in Wolfsburg: "This will require us - following the serious setback as a result of the diesel issue - to learn from mistakes made, rectify shortcomings and establish a corporate culture that is open, value-driven and rooted in integrity." The company's components business, spread across 26 plants, will be streamlined, and there will be a focus on cutting sales and administration costs. On Thursday, car sales data from the European Automobile Manufacturers Association suggested that the VW group continues to suffer from the impact of the diesel scandal. Sales of Volkswagen-branded cars rose 4.1% in May, compared to the same month last year. But that was sluggish when compared to 28.7% growth for Renault and 18.7% growth at PSA Group, owner of Peugeot and Citroen. Market share for the group, which includes Audi, Skoda, and Seat, for the five months to May, was 23.9%, the lowest for the period since 2011.